The Dolphins are a surprising 3-0 and they have gotten it done on both sides of the ball so far in the 2018 NFL season. Quarterback Ryan Tannehill has looked solid this season after missing the last season due to injury. You would think that Miami’s defense has not played well, only ranking 21st in the league, however, they rank second in the league in takeaways and they rank sixth in the league in points allowed per game. The Patriots fell to 1-2 in their last game on Sunday night losing to the Detroit Lions 26-10. The Pats only had 209 total yards, only had 12 first downs, and they allowed 25 first downs. Tom Brady did not look like Tom Brady and the whole New England team simply looked out of sync. Hard to believe a Brady-led team only ranks tied for 25th in points per game and 26th in passing yards per game. The Patriots have covered the spread in their last six home games facing the Dolphins. 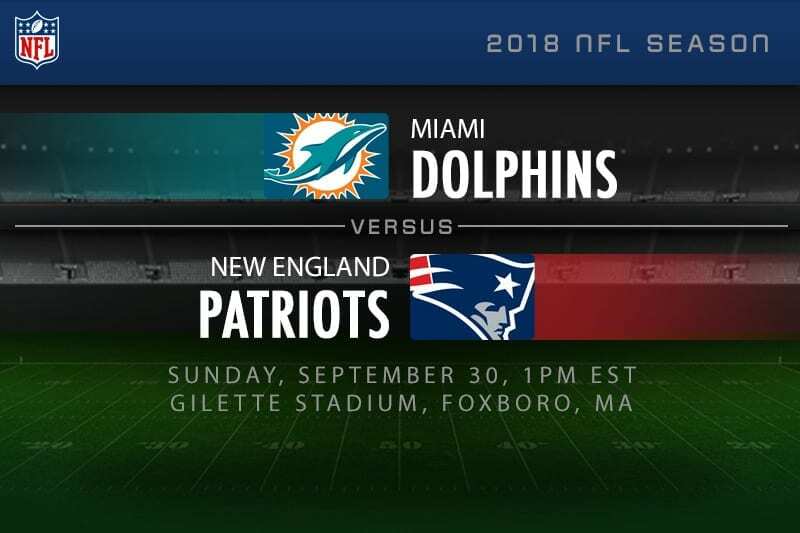 This season the Dolphins are 3-0 ATS and they have an Over/Under record of 2-1 with the Patriots at 1-2 ATS with an Over/Under record of 1-2. The Dolphins moved to 3-0 on the young season with a 28-20 comeback win over the Oakland Raiders in their last game. They were out-gained by 61 yards, they gave up 25 first downs, and only had 41 rushing yards. However, they came up big late outscoring Oakland 14-3 in the fourth quarter and they forced the game’s only turnover. Ryan Tanjnehill had another impressive performance under center to the tune of 289 passing yards with three touchdowns and no interceptions. He spread the wealth to his targets and it was key that he avoided getting picked off since he got no help from the run game. Actually, he was the run game accounting for 29 of the 41 rushing yards. The Miami running back duo of Kenyon Drake and Frank Gore struggled mightily in the Oakland win and they will have a chance to redeem themselves facing a Pats’ run defense that ranks second to last in the NFL. I am sure Brady would like to forget the loss to the Lions where he only passed for 133 yards. Sony Michel had 51 rushing yards on a not-so great 3.6 yard per carry average. New England only converted two of their nine third downs and they allowed the Lions to pick up 25 first downs. Brady has not looked in sync with his receivers and the run game has been less than stellar. Brady will be facing a Miami pass defense that ranks third-to last in the league, but also leads the league in interceptions. The Dolphins have looked good while the Patriots have not, but in New England you cannot count out Brady and company. They have covered in their last six home games facing the Dolphins, who have failed to cover in five of their last six road games. Those betting trends will continue this Sunday, as the Patriots will win and cover, get back to .500, and hand the Dolphins their first loss.